I’m not sure if it comes across this way, but using that title there doesn’t mean that I don’t feel like I’m on the proper track to success. On the contrary, I’m just feeling a little impatient today is all. Success will get here. I’ve been doing a lot of online reading (learning) today and I’m feeling pretty good about myself, but I’m not actually getting any ‘real’ work done. Time has flown by and it’s already midnight (not sure how that happened), and I haven’t brought out my tablet yet to draw anything. An evening like this would be perfect to go out and take some photographs; which is something I’m excited to get started on as a regular thing I’ll be doing often. One of my Patreon goals is to eventually hit $50 per month in patron subscription monies, and purchase myself a decent digital camera as a reward for hitting that goal. I’ve never owned one before, but I’ve always wanted to get one. I figured if I was bringing in $50 or more per month via Patreon, then I’d be able to spend a little of what I’ve saved up to shop for a camera. Once the camera was in my hands, I’d immediately begin a second Year of Creative Habits project where I’d take a photo everyday and tell a brief story to go along with it. 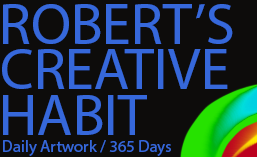 It would, of course, be shared right here on this website just like my previous 365 day long project. I don’t believe that my photographs would be boring, either. It’s almost a daily routine for me where I go for a walk and discover cool and interesting things that I wish I could take record of. I own a tablet, but it’s a pretty cheap one and the camera isn’t all that great. Especially for nighttime shots. Not to mention that I don’t like carrying awkward devices with me when I’m away from home (I’d make an exception for a proper camera!). There’s so much technology around me in my apartment, it’s important for me to leave all these distracting devices behind sometimes. When I’m using my laptop, drawing, and listening to music, all at the same time, there’s just so many wires all over the place that when I have to get up for anything it’s just a whole exhausting process trying to set everything aside so I can actually get up off the chair. It’s safe to say that I try not to spend too much time at home, and it’s an everyday goal of mine to get out at least once and walk. Just… go anywhere. Somewhere. Usually to the grocery store to pick up some food stuffs. But often I’ll just walk to the local Tim Hortons to nab a hot coffee to take home with me. By the time I get home it’s cooled, ready for me to enjoy. There’s just something spectacular having a warm beverage when I’m on my laptop doing whatever. …I think I’ll get some of that ‘real’ work done when I return. This entry was posted in Inspiration, Photographs. Bookmark the permalink.